As CCS Insight predicted, top Internet-centric companies are continuing to build their brands with real-world exposure to offer hands-on opportunities for consumers. It's the result of a growing amalgamation of hardware, software and services and increased competition between industry players. 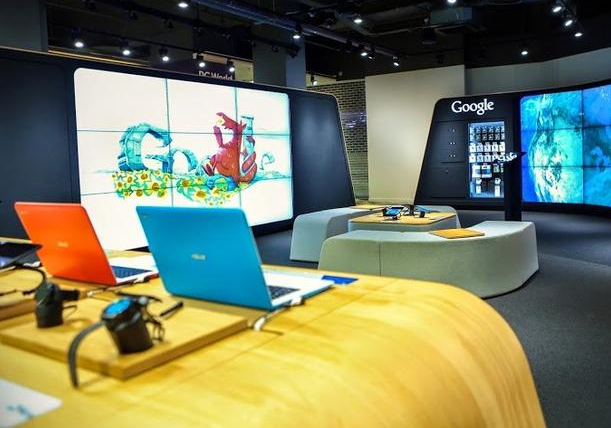 Last week, Google opened a physical location within a Dixons Carphone store in London in order to explain the benefits of Google-related products including Android-based phones, tablets and wearables, Chromebooks and Chromecast devices. Such locales can be expected to do more showcasing than sales, but the move reflects the growing importance of "Genius baring" — taking the time to tutor customers and to sell general concepts as much as specific products. Google's store-in-store presence in London reflects the expanding breadth of tech companies across domains. The notion that an Internet search brand would need a brick-and-mortar presence to protect and grow market share would have seemed perplexing a decade ago. However, Google displays now sit alongside those of Microsoft and Samsung in an attempt to sell holistic solutions, with on-site representatives allowing companies to explain new products. The retail strategy in England isn't a first for the industry or for the company: Google already has stands within Best Buy stores in the US. CCS Insight expects more Internet brands to cross over to the physical world, but the trend could cause disruptions as well as opportunities for traditional high-street retailers. Global technology companies are feeling the pressure to create experience-focused shops along the lines of Apple's stores. Person-to-person explanation and instruction will help to augment existing support and sales infrastructures, particularly as Google expands across domains with devices including Nest for the home and Chromebooks for schools. There's a lot more retailing in store for companies like Google.